Garmin BlueChart g2 Vision HD charts were superceded on 27th February 2019 by a new Garmin BlueChart named g3 Vision. All Garmin BlueCharts purchased from ActiveGPS on or after this date feature the new Garmin BlueChart g3 or g3 Vision format. Garmin BlueChart g2 Vision HD charts provided high-precision rich, seamless marine charting on compatible Garmin marine products. 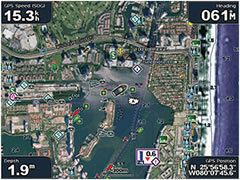 The g2 Vision HD version of Garmin's marine charting provided a number of features including: high-resolution satellite imagery, above and below the waterline 3-D perspectives, 3.0 Auto Guidance technology, aerial photography of ports, harbours, marinas and waterways and coastal roads (up to 5 miles inland) and more. G2 Vision charts were available in three different sizes: large, regular and small. The larger the chart, the more area is covered without the need to change or buy additional charts. We suggest buying the chart(s) that provide the coverage for your sailing, fishing, yachting needs. Garmin g2 Vision HD marine charts were replaced by Garmin g3 Vision version in February 2019. Just like their predecessor, g3 Vision come in three different sizes: Small, Regular and Large. Click below to discover the range of charts available to buy from ActiveGPS. BlueChart g3 Vision small charts provide a limited yet fairly substantial area of waters around the British Isles and Europe. View the latest Blue Chart g3 Vision Small charts. BlueChart g3 Vision regular charts are ideal if you'd like to explore more of the coastline than where your boat/vessel is moored. View latest Blue Chart g3 Vision Regular charts. BlueChart g3 Vision large charts provide the largest available g3 Vision chart coverage on a single micro/SD card. View the latest Blue Chart g3 Vision Large charts.